In The New York Times today, Eason Jordan, chief news executive at CNN, reveals that CNN has known details of Saddam Hussein's brutal regime for over a decade, but didn't report it for fear of reprisals against its staff in Iraq. Over the last dozen years I made 13 trips to Baghdad to lobby the government to keep CNN's Baghdad bureau open and to arrange interviews with Iraqi leaders. Each time I visited, I became more distressed by what I saw and heard — awful things that could not be reported because doing so would have jeopardized the lives of Iraqis, particularly those on our Baghdad staff. Intriguingly, Right Thinking has a story about Scott Ritter, who withheld information about a jail for children in Iraq because "what I saw was so horrible that it can be used by those who would want to promote war with Iraq, and right now I'm waging peace." Read what Lee at Right Thinking has to say on this: here. Stupid bleeping unwashed American masses - we can't handle the truth. "Nobody has impunity at the moment, nor at any moment," he said, banging his fist on the table during a marathon eight-hour meeting with reporters that ended early Thursday. "We cannot allow ourselves to be tolerant with them." "The protesters had hoped to demonstrate for human rights, democracy and the release of political prisoners. " "One of the biggest waves of political oppression in recent years is taking place," Elizardo Sanchez, head of the nongovernment Cuban Commission for Human Rights, said in a statement. 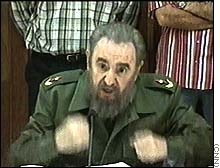 Apparently, some people aren't as delighted about Cuba's wonderful health care system as American Liberals. 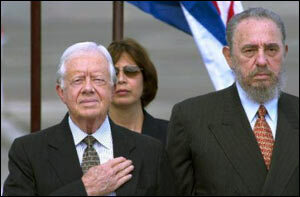 I wonder what Castro fans Jimmy Carter and Katie Couric have to say about that? I get so confused sometimes. Harry Belafonte criticizes a black man because he is black, and well, that's okay. A Republican does it, then oops! Go see Right Thinking for Wednesday 9 April 2003.
hy·per·bo·le (h -pûr b -l ) n. A figure of speech in which exaggeration is used for emphasis or effect, as in I could sleep for a year or This book weighs a ton. It seems that hyperbole is the name of the game regarding the Iraq War of 2003. From protesters to big supporters, liberals to conservatives, LWW's to RWW, it is a tool that insulates those parties from addressing the true issues. We are setting a precedent by 'invading' Iraq. The invasion of Iraq is, by no means, the first time we have invaded a country that did not attack us. In the last 50 years, we have invaded Korea, Vietnam, Panama, Grenada, Haiti, Belgrade, and Iraq ( Bush I). In all of these cases, we attacked without being attacked by those countries or agents of those countries. You could even include Afghanistan, because the link between Al Qaeda, the Taliban and 9/11 was not discovered until after the invasion. So our incursion into Iraq is hardly a precedent. Even regime change is not a precedent when you consider the reasons for attacking Panama and Haiti. I guess when you have no argument, you can always make one up! Next up -- unilateral action. "There isn't one American soldier on Baghdad soil," said a reporter speaking from the Iraqi capital on Lebanon's Al-Manar television station, which is run by the militant Islamist group Hezbollah. Asked about the sound of guns in the background, he explained that it was caused by Iraqi soldiers firing into the air in celebration of pushing back the Americans. Now more than ever, the world needs to hear the voices of poets. Poets Against the War is calling for May 1, 2003, to be an International Day of Poetry Against the War. How does one recall a Senator? Norm Coleman (R - MN) said something bad about Paul Wellstone (Deceased - MN). Ex-CIA director: U.S. faces "World War IV"
But just a week ago, Rummy was the dummy. Remember? He hadn't sent enough troops. His supply lines were way too long. Iraqi soldiers weren't deserting the way they were supposed to, and the locals, instead of cheering, were decidedly hostile. Baghdad was going to turn into Stalingrad or Mogadishu. The entire war plan was deeply flawed. Things were going so bad that the U.S. Army's senior commander in Iraq confessed, "The enemy we're fighting is different from the one we war-gamed against." That quote, from Page 1 of The New York Times, was recycled by armchair experts and reporters around the world. "Stumbling Giant," pronounced The Times of London. "Hopes of a quick coalition victory disappearing," intoned a CBC reporter, who referred to the general's comment as a "verbal bombshell." Except that's not exactly what he said. What he said, according to a New York Times correction, was: "The enemy we're fighting is a bit different from the one we war-gamed against." The Resources Page is now in full swing. It this the proverbial "smoking gun"? The controversy over a Columbia University assistant professor who called for the bloody defeat of U.S. troops in Iraq refuses to die, with critics heaping scorn and supporters saying he has gone into hiding after receiving numerous death threats. Now I know where the Left are getting their war coverage.